Sometimes a band is best as a cartoon. A-ha’s animated shaky charcoal drawings for their hit “Take On Me” brought the Norwegian band to fame. Blur’s Damon Albarn created a “virtual band” with Gorillaz, an animated character-driven collaborative project featuring him and a rotating cast of other musicians. 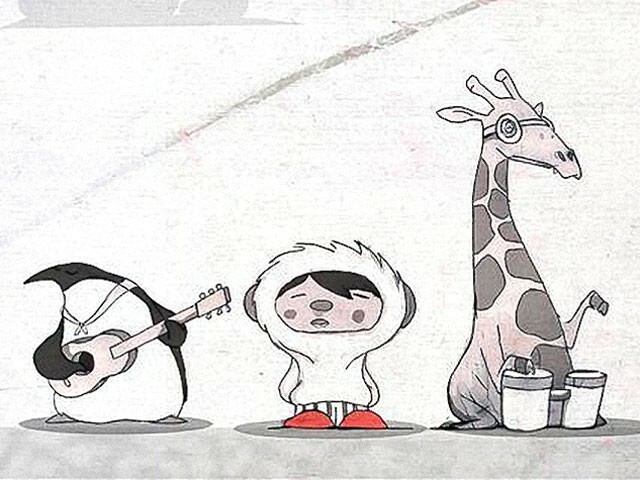 One eskimO, a British band led by self-proclaimed “former” pop star Kristian Leontiou, are the newest animated kids on the block. The band produces techno-infl uenced, highly atmospheric pop and sets it to idiosyncratic cartoons. Where Gorillaz tunes are macabre and dark, fi lled with cyberpunk post-apocalyptica, One eskimO weaves yarns taken straight from the starry dreams of a child who still believes his stuffed animals are living creatures. One eskimO takes solace in the quiet, the comfortable and the saccharine — theirs is a mild, candy-fi lled world full of softly falling snow and steaming mugs of hot cocoa. Leontiou received his motivation for starting the project after a so-called epiphany while in the midst of his solo career. He wanted to cast off the trappings of mainstream success and embrace a new style, one that centered around creating his own world rather than accepting one foisted upon him by the industry. So he created a storyline that follows the adventures of an itinerant Eskimo, a penguin, a monkey and a giraffe on their quest to rescue the Eskimo’s American Indian girlfriend (complete with the requisite feathered headdress). It’s Leontiou’s soundtrack to the imaginary epic in his own head: a story that’s precious and cutesy, reminiscent of Peanuts TV specials without the melancholia and disappointment that made them so memorable. Divorce the music from the media, though, and you have something worth your attention (even though, like Albarn, Leontiou’s voice is overwhelmingly Limey). One eskimO makes music that is content to fade into the background. Buoyed by acoustic picking and shimmering orchestral fl ourishes, Leontiou sings sweetly and nostalgically about love and distance. Strong stomachs may fi nd it too sugary, but sweet teeth will enjoy the taste. One eskimO plays with Jerad Finck and Ron Greene at the Knitting Factory on Tuesday, Dec. 15, at 7:30 pm. Free. Allages. Visit www.ticketswest.com or call 325-SEAT.